Just like humans, dogs and cats need proper diets, lots of exercise, mental stimulation, and socializing to remain vibrant. Start proper care when they are young and that will keep them young for a long time. What Is A Proper Diet For Your Pet? To be brief, a proper diet for a pet closely resembles what his canine and feline relatives eat in the wild. It is fresh and it is served raw. It contains at least 50 percent protein from poultry, meat, or seafood, as well as uncooked edible bones, and fruits and vegetables. It does not contain grains, fillers, food preservatives, or anything that is made through a manufacturing process, although certain supplements should be added, like krill oil or other source of omega-3s, taurine for cats, and other supplements on the recommendation of your veterinarian. Toby's owner has been kind enough to show us how he prepares Toby's meals in a swinging YouTube video in which Toby nearly eats his bowl after finishing his food! Look up other raw food diet for dogs videos and raw food diet for cats videos and you'll get some great ideas on meals to fix for your pet. For more information about raw diets for dogs and cats, watch this video by Dr. Karen Becker on Healthy Pets. Pre-made natural diets: If you don't have a lot of time to make your pet's food from scratch, you can usually buy vegetables already cut and in bags at the supermarket - make sure you rinse them with fresh water before serving. If that's not possible, you can buy dehydrated raw vegetables such as those made by The Honest Kitchen. With these, you just add water and raw protein and your pup is good to go. They will save you a lot of time and money. I haven't seen anything that suggests the Honest Kitchen base mix cannot be served to cats. Prowl for cats is dehydrated and is also made by Honest Kitchen, but contains its own protein source - dehydrated chicken. Daily exercise must be a regimen for every pet, just as it needs to be for us. Playing fetch, running, and agility training are great physical exercises for a dog... Regular walking is good for you and your dogs too! Chuck-It is one of the best fetch toys for a dog. ... just as chasing a hand-held red laser beam up and down the walls or on the floor, or chasing just about anything makes a cat more physically fit. (All laser toys are not the same: read Cats, Dogs, and Laser Toys.) Just make sure that that your kitty can't see the source of the beam. The Cat Catch Laser Pointer is a fun toy and provides variable blinking options. Keeping a pet's mind stimulated is just as important as exercising his body. You can hide his favorite things around the house, let him hide them - my dog will tease me with his toys and then, after I follow him around for awhile he will take off and hide them somewhere. Then he will retrieve them the next day. If you are pinched for puzzle ideas, though, here are a few puzzle products you can purchase. Outward Hound has a very popular puzzle toy with squeaky squirrels hiding in a tree trunk. It comes in 4 sizes, and I suggest the 'ginormous' to give your dog a maximum experience. The object of the puzzle is for your dog to find the squeakers (squirrels) inside the trunk which will squeak as he chews on it. You should hide them better than shown below! I recently wrote up a neat dog ball that provides exercise, teeth cleaning, and mental stimulation. It's the Playay Tooth-Cleaning Play & IQ Ball. Smart Cat has both a Peek a Prize cat box, a great mind-toy for one or multiple cats. And my fave for one or more cats, the Trixie 5 in 1 Activity Center. Each of the five areas of the puzzle requires a different skill to remove the treats, and your cat has to figure out each one. 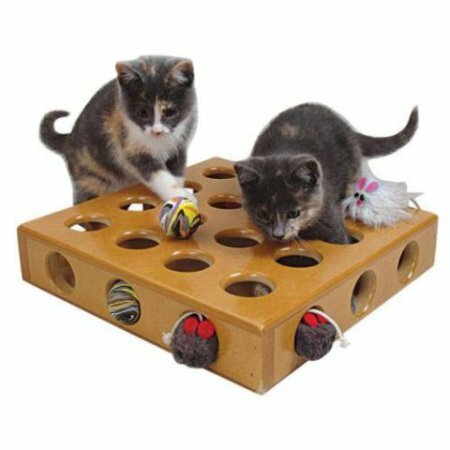 Look for the most mentally stimulating toys when shopping for your dogs and cats, or invent different hide-and-seek games for them to play. Socializing with other pets is great fun and great companionship for dogs and cats. If you train them properly, your dogs and cats will enjoy members of their own species and even each other. (Read How Many Dogs? 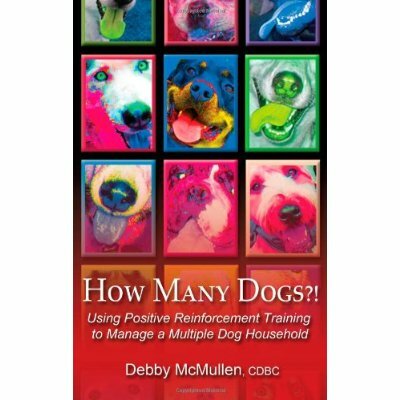 Using Positive Reinforcement Training To Manage A Multiple Dog Household and Cat Vs. Cat: Keeping Peace When You Have More Than One Cat, or this article about Cats & Dogs Living Together. If you don't have multiple dogs, or even if you do, find a dog park for your pup and let him play and interact with other dogs. Make sure the park is kept clean and that your pup's vaccinations and other prevention meds are all up to date. When you go to a dog park, it's a good idea to watch your dog at all times instead of chatting with other dog owners. You need to make sure he's not ingesting anything he shouldn't. I keep my yard clean and invite my dog's friends to come to my home several times a week to play instead of going to a public dog park. If you don't have a yard, take your pup for walks in a busy part of town where she will meet and greet other dogs and people. Cats who stay indoors should be socialized with people as much as possible and be rewarded for interaction with them. Another cat or dog could make a great playmate if properly introduced and trained. Playing with your cat, grooming her, and just hanging out with her are also forms of socialization which will help her stay mentally healthy and alert. Very clearly, cats and dogs need the same elements in their lives as humans do to protect them from dementia: healthy diet, exercise, mental stimulation, and socialization.